Want to time stamp a conversation or a message in the iChat messaging client? You can do that quickly with a keystroke on the iChat app in Mac OS X. 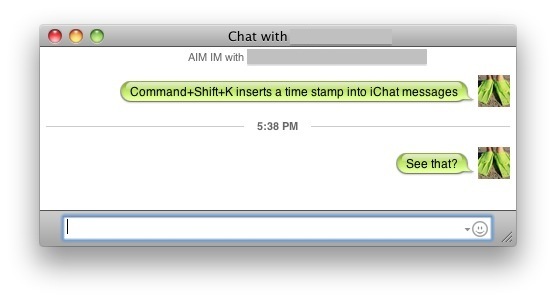 To instantly add a timestamp to any iChat messages, just hit Command+Shift+K in any chat window. This will insert the time stamp into the window of the message and include it in the chat log, but it does not send a message including the time and the person on the other end of the conversation will not see the time stamp. Thanks to Ryan for the nifty iChat tip! Of course, iChat is only available on older versions of Mac OS X, and modern Macs use Messages instead. Now, you will find this isn’t available in Messages for Mac, which instead opts to timestamp messages automatically when a conversation has started or resumed after a delay, or an individual message by using a mouse-hover action on the message to view the time sent or received. On Messages for iOS with the iPhone or iPad, you can also get the timestamp on any message conversation with a swipe gesture on iPhone. Is there a way to see the time stamp for all messages in your chat message history?